A destitute young man with learning difficulties is torn between an affectionate young woman and his volatile brother. Director Joe Stephenson fits comfortably in the lineage of great British social realist filmmakers like Ken Loach, Mike Leigh, Alan Clarke and Shane Meadows with an assured, confident and mature debut behind the camera, while young actor Scott Chambers delivers a contender for performance of the year in his first feature lead role. Two remarkable new young British talents storm the screen in this gritty but sweet drama. Director Joe Stephenson fits comfortably in the lineage of great British social realist filmmakers like Ken Loach, Mike Leigh, Alan Clarke and Shane Meadows with an assured, confident and mature debut behind the camera, while on its other side young actor Scott Chambers delivers a contender for performance of the year in his first feature lead role. Chambers is Richard, a 15-year-old with learning difficulties eking out an existence in the battered and rusted caravan he shares with his volatile older brother Polly (Morgan Watkins). The latter spends his days performing menial labour in scrapyards and touring carnivals before drinking away his earnings in a local pub, while Richard is left to forage for food from nearby farms, while carrying out conversations with his pet chicken. The animal appears to be Richard's only friend until a new family moves into the house whose land his caravan resides on. While stealing from her clothesline, Richard meets the family's teenage daughter, Annabelle (Yasmin Paige), and the two form an instant if initially awkward friendship, but Richard's newfound happiness will be tested by the actions of his increasingly troubled brother. With its rural East Anglian setting, Chicken immediately sets itself apart from its British social realist peers; crumbling council estates are replaced here by rolling dales and lush scenery. If not for the accents, Stephenson's film could pass itself off as an indie from the other side side of the Atlantic. The setting is closer to recent US films like King Jack and Hide Your Smiling Faces than the urban dystopia we usually associate with UK drama, and it's the sort of rural story Twain and Steinbeck might have penned (think Of Mice and Men if Lenny were the one who had his act together). Yet the film captures everyday life with the sort of realism the brits have mastered like no others over the decades. The film's success hinges heavily on the performance of its lead, and Chambers is more than up to the task. His work here is quite outstanding, and within minutes of his appearance we understand we're enjoying the privilege of watching an incredible new talent. I haven't seen a young actor essay this sort of character with such conviction since Leonardo DiCaprio in What's Eating Gilbert Grape; may Chambers enjoy an equally subsequent rise. 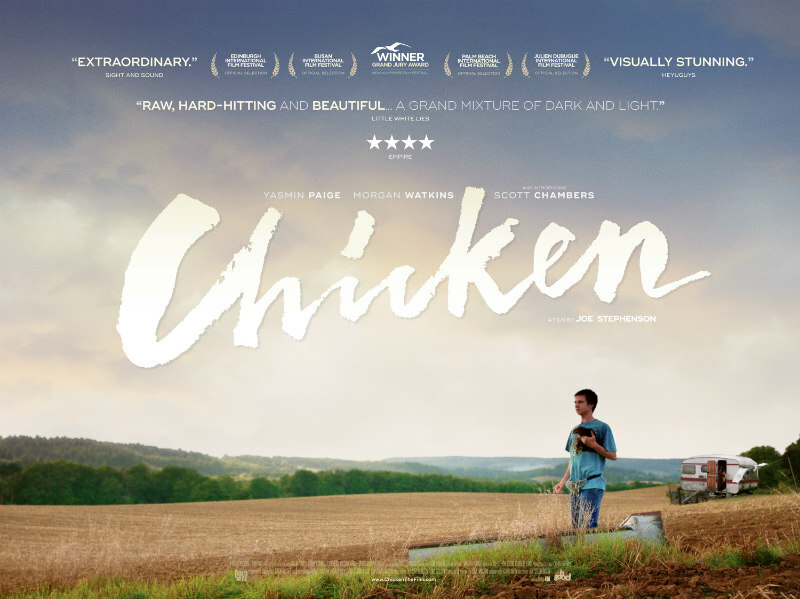 Its plot doesn't deliver much in the way of unique material, but Chicken is first and foremost a character drama, and a superior one at that. The central trio are all disparate figures, but equally beguiling, and any one of the three could have been the focus of their own story. The nuance of the script combined with the heartfelt performances results in an overlapping Venn diagram of sympathy/empathy/scorn. With a relatively brief running time of 86 minutes, Stephenson's film leaves us wanting more from these characters. Is there any truer mark of a successful drama?